When you walk onto Hilton Head Preparatory School’s campus, you will see international students playing basketball on the outdoor court, lower schoolers conversing with upper schoolers, teachers sitting with students going over homework, and parents volunteering. You will see a scholarly environment that exudes community, harmony and happiness. In short, you will see a place where you know your child will excel—academically and beyond. When it comes to service and the community, Hilton Head Prep motivates their students to view volunteerism as an opportunity in leadership and in building character, as well as a way to better the students’ world around them. “Our students, whether on scholarship or not, recognize that they have been given a gift to go to a school like ours,” Hopman explained. Hilton Head Prep also believes in being flexible to accommodate their students’ interests. From sports academy students, to students pursuing an honors diploma in a specific discipline, to students involved with the theatre, Hilton Head Prep will work with each child and family to ensure his or her aspirations beyond academics are accomplished. 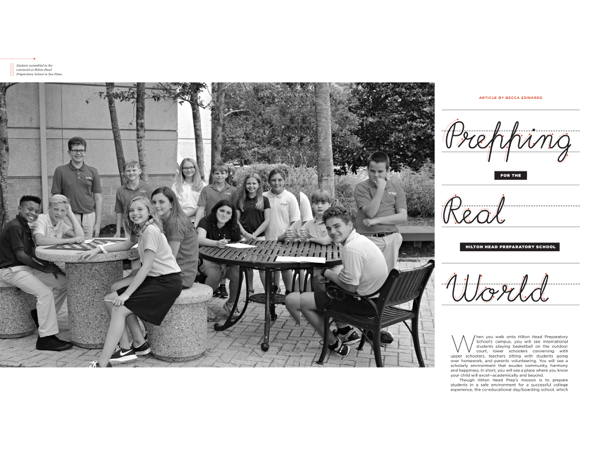 Hilton Head Prep is the area’s preeminent, only NAIS-affiliated independent school. Prep is also SAIS and SACS accredited. In the 2019 K-12 Niche ratings, it was recognized as the number one private school in Beaufort County, the number one boarding school in South Carolina, the number three private school in South Carolina and in the top 15 percent of private schools in the nation. Equally important, whenever a new student enrolls at Hilton Head Prep, the family sits down with the appropriate division head and, together, they map out the child’s academic path. “We believe in communicating one-on-one so there are no surprises,” Hopman said. “Our main goal is to take every child from where they are and help them achieve their highest potential,” Brown said. Hilton Head Preparatory School is located at 8 Fox Grape Rd., Hilton Head Island. For more information, please visit www.hhprep.org or call (843) 671-2286.